Úvodní stránka ENG About alleged Michio Hoshino’s last photograph of a bear. 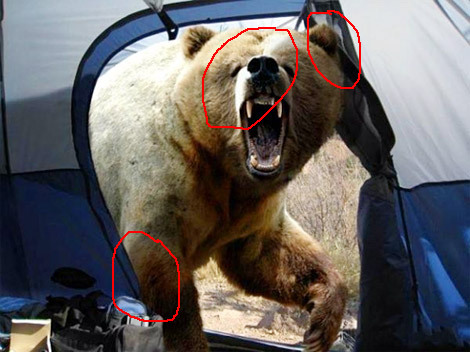 As for the photo itself, we can observe that it was created as a composition of two photos—a tent and a bear ones. If you look at the light, it is clear it could not be done in 4 a.m. The light on the photo is more like noon. Also, we see that the bear’s head is inside the tent, but the light on his nose does not support that notion. In addition, notice the shadow from the plants outside the tent, notice the light inside the tent—all points out to the sun being on the right side of a photographer. The bear, on the contrary, is lit from the left—I doubt there was an external flash outside the tent. And what is more revealing—is that the bear’s foot is also inside a tent, but in a strange way—too sharp line of a tent material, not the whole width of a foot is inside. Putting all the evidence together, we can say that this is clearly a fake photo. Update: the photo was photoshopped by a user BonnySaintAndrew as a an entry for a Final Photo 9 contest. 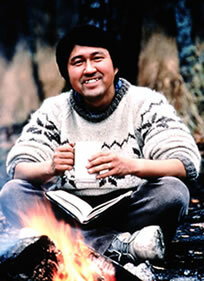 Some of his photos can be viewed on University of Alaska museum website. Předchozí příspěvek Klavs Bo Christensen’s “too much Photoshop” disqualification.